What's it like to grow up with Keith Moon for a dad? As Keith Moon’s daughter, Amanda De Wolf experienced the madness and excess of life with rock’s greatest drummer. To celebrate the publication of a new book, A Tribute To Keith Moon: There Is No Substitute, the former Mandy Moon grants Classic Rock a rare audience and offers a candid trip down memory lane. You’ve not talked publicly about your dad much before. What made you give this book your blessing? I heard Pete Townshend was writing something for it, so I thought, Oh, Okay. I’d been interviewed for that Keith Moon: Final 24 documentary [in 2007] and I regretted it. The only reason I did it was that it was right after my mum [Keith’s ex-wife Kim] died in 2006. She’d appeared in a VH-1 documentary about Keith and I was pleased to have that reminder of her on film. So I did Final 24, so maybe if something happened to me… (laughing) my kids would have a reminder. But it turned out to be very sensationalist. So I was concerned about doing anything else. But when I heard Roger was on board and Pete had written the Foreword, I figured they wouldn’t take part in anything that wasn’t right. What do you think of the way he’s portrayed in the book? It’s good because it’s more of an appreciation of the music – and how good he was as a drummer. In the past, I think the antics overtook the drumming. People thought Keith had no training and came from nowhere, but he came from a real jazz foundation. He loved [US big band drummer] Gene Krupa – both his playing and his showmanship. Did you discover anything you didn’t know about Keith before? I learned so much. People talked about how he sped up and slowed down when he played, how sloppy he was, but it worked for The Who. I think Keith was almost like an orchestrator, conducting The Who’s playing. I can see that now, but I’d never thought about it before. Keith died when you were 12. Do you have many memories of him? I don’t remember the very early years. I remember more after we moved to Tara [the house in Chertsey, Surrey, bought by Moon in 1971]. Unfortunately a lot of the memories are not good. When he was home, there was a lot of drinking and it wasn’t conducive to having a kid in that environment. My memories are not all bad, but I was not close to him. I don’t remember him saying too much to me. But he used to call me his little lion cub – because he loved lions. He had a lion necklace he wore. Did you find out more about him after he died? Yes, I’ve heard a lot from other people. Keith’s mum told me a lot. I was a bit scared of him to be honest because of the way he treated my mum. I didn’t see so much of his good side, and maybe that’s one of the reasons I haven’t talked about it too much. I don’t want to taint the way people feel about him. But I think people know he was a real Jekyl and Hyde character when he was drunk. But then so was I. Did you think you inherited that from Keith? Yes. I didn’t inherit the drumming talent but I inherited the drinking (laughing). But I’m sober now. I know he cared about me, but my mum and dad were both very young, and Keith was not really ready to be a dad. The most fun times tended to be when people came to visit us. He loved an audience then? Yes, especially when people came over to take pictures. So he’d be dressing up. We had a helicopter land at Tara once so he painted a big H out on the lawn. Then there was the time he fell asleep in the swimming pool and mum had to bring him. Fun memories, but not very normal memories. Do you get recognised and asked if you’re his daughter? Sometimes, because I do resemble him. We moved to America and into his Malibu beach house when I was 12 after he died. So at school people would hear my surname and ask. People used to think Moon was his stage name. But it was real. But I got married the first time when I was 18 and I’ve always taken my husbands’ names. In fact, my husband talks about him more than I do. People come up to me sometimes and say, “Oh my God! 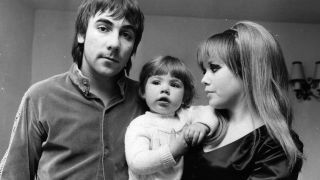 Your dad is Keith Moon!” – and it’s because he’s told them. What are your favourite photos of your dad in this book? I like the one where he’s wearing what I think is a mouse suit, but Pete’s put the head on. The look on his face is so sweet. It’s a genuine smile. Not put on. There’s also the shot of Keith when he was very young, a teenager, and that’s at nanny’s house in Sudbury [West London]. I recognise the door! Keith’s mum is 95 now and she sent me a letter recently saying, “Am I ever going to see you again?” So that’s settled it. We are going to England to visit her this year – in August. Finally, has your opinion of Keith changed over the years? Yes, now I’m older – I’m nearly 50 - and since I’ve had my own kids, a lot of the anger has dissipated. I’ve softened. And, like him, I’ve done many things I regret. My kids are 15 and 18 and I want them to embrace Keith and have fun with his story. I want them to enjoy the perks of being his grandchildren. A Tribute To Keith Moon: There Is No Substitute, compiled by Ian Snowball & The Estate Of Keith Moon, is out now, published by Omnibus Press.